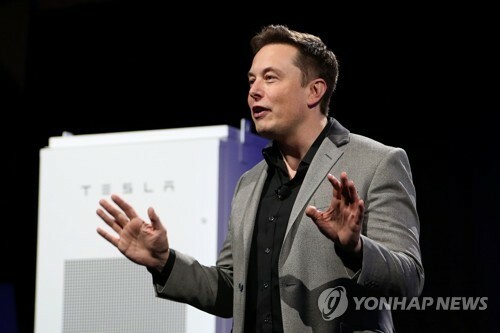 ADELAIDE -- The world’s biggest lithium-ion battery has plugged into an Australian state grid, an official said Friday, easily delivering on Tesla Inc. chief executive Elon Musk’s 100-day guarantee. South Australia Premier Jay Weatherill announced Friday the battery began dispatching power into the state grid on Thursday afternoon, providing 70 megawatts as temperatures rose above 30 degrees Celsius. “South Australia is now leading the world in dispatchable renewable energy, delivered to homes and businesses 24/7,” Weatherill said. The battery power packs are installed near the Outback town of Jamestown, about 200 kilometers north of the state capital Adelaide. They store energy generated by the neighboring Hornsdale Wind Farm, owned by French renewable energy company Neoen, to bring added reliability and stability to the state grid. The battery farm is part of a 550 million Australian dollar ($420 million) plan announced in March by Weatherill to make the state independent of the nation’s power grid. The cost of the battery has not been made public. The Australian grid operator has warned of potential shortages of gas-fired electricity across southeast Australia by late next year. The shortage is looming as Australia is expected to soon overtake Qatar as the world’s biggest exporter of liquid natural gas. Australia is also a major exporter of coal, which fires much of its electricity generation and makes the country one of the world’s worst greenhouse gas polluters on a per capita basis.